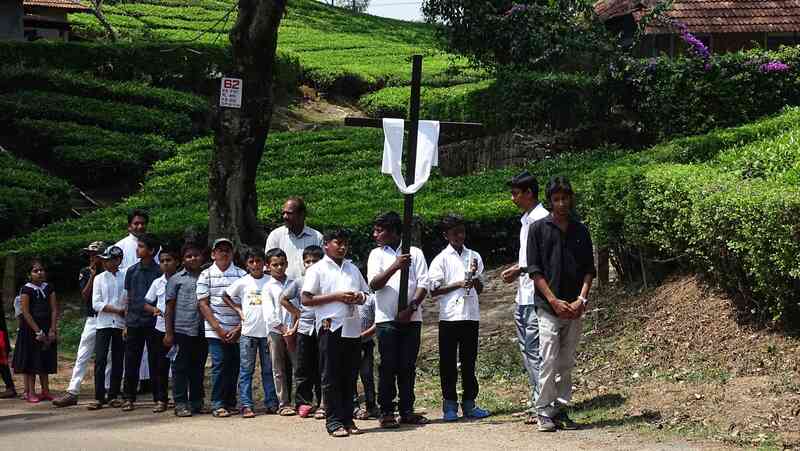 Valparai is situated in the middle of tea estates and at the edge of a protected forest. This makes it easy to spot birds and mammals. Since butterflies do not normally travel very far, the monoculture of the estates reduces the visible diversity. 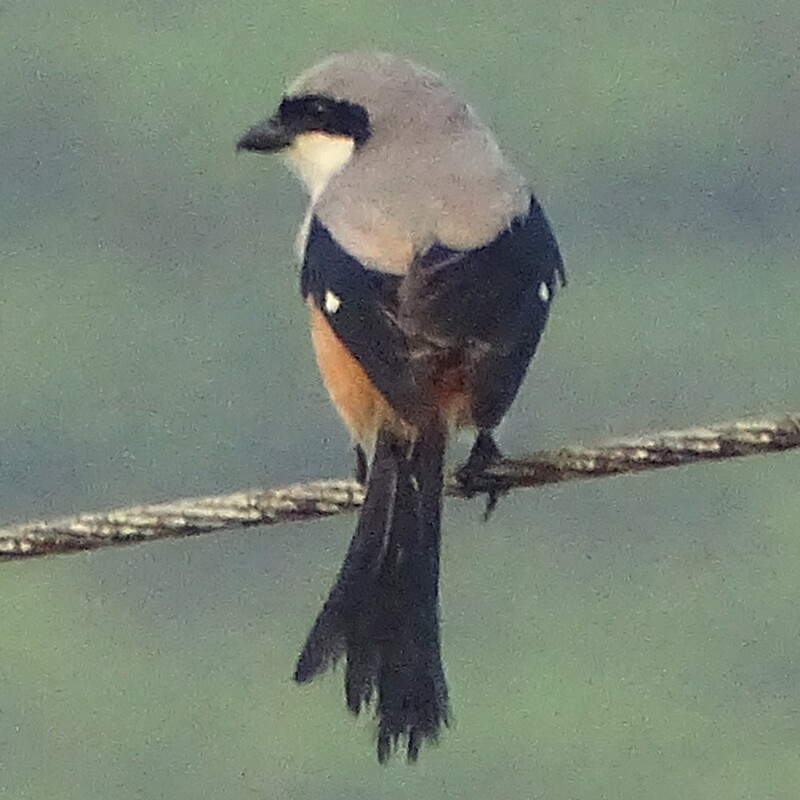 As the last of my posts on Valparai, I just list the birds, animals and butterflies we saw. During the time we were there, elephants, leopards and civet cats were spotted; we were just not lucky enough to see them. Wild pigs: we saw these as we passed through the Anamallai tiger reserve on the way to Valparai. Indian gray Mongoose: quick glimpses, but one stood still long enough for The Family to catch it on her phone. 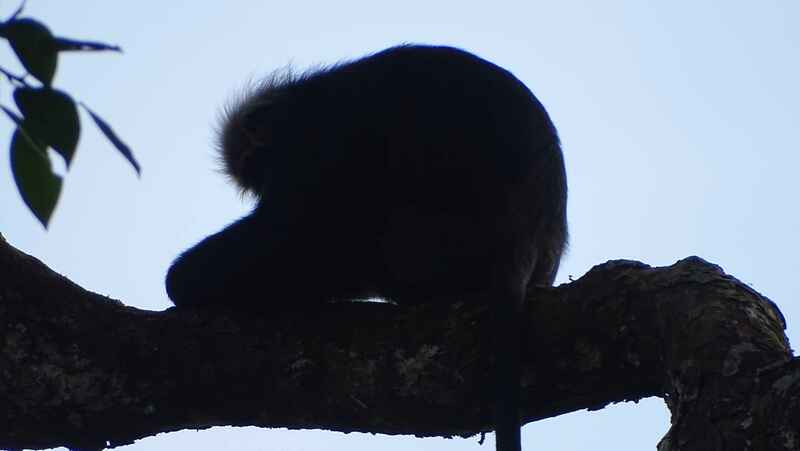 Lion-tailed macaques: saw one band at close quarters. In this region they appear to be habituated to humans. Malabar langurs: saw a band feeding near a road. Very shy, they flee when they see humans. Gaur: many family groups visible grazing in the tea estates. In this region they are totally habituated to humans. Barking deer: shy creature. Saw one crossing a tea field. 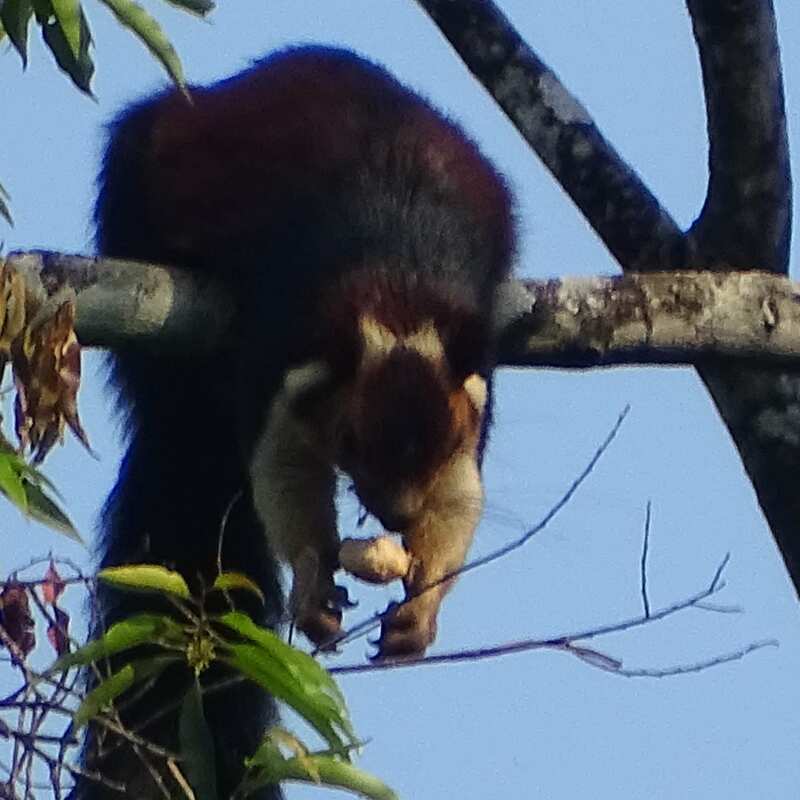 Malabar giant squirrel: heard them very often, and saw them feeding and sleeping on trees near the road. Nilgiri tahr: saw them on the Pollachi-Valpari road near the 8th bend. There are posted tahr crossings at the 9th and 13th bends. 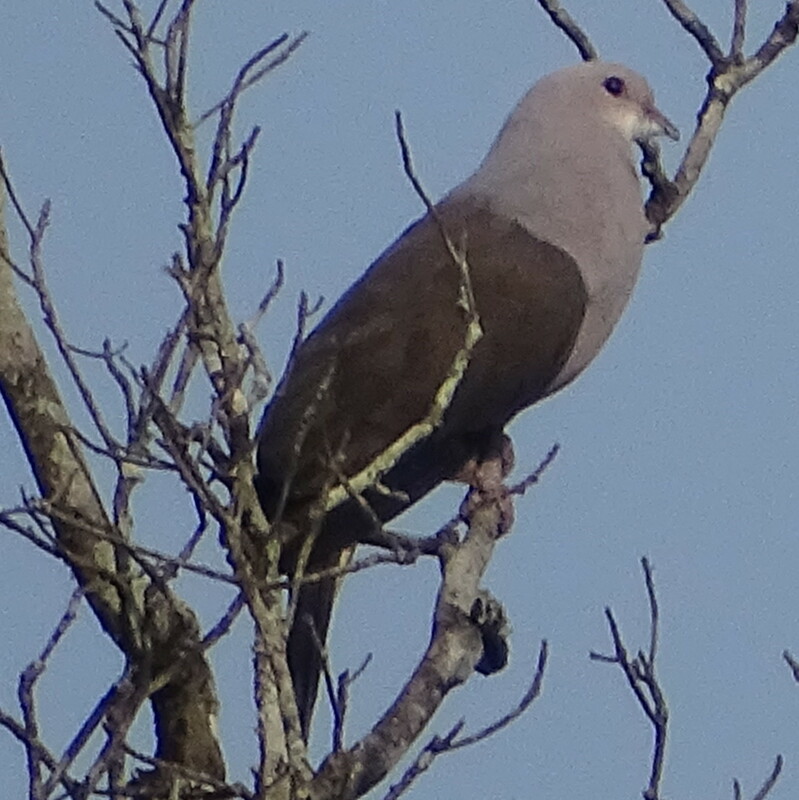 I’m not good at birds; I spot some only when there are birders with me spotting away. The Family is good at it, and she says we missed many of the smaller birds. We also heard birds which we did not see: the raquet-tailed drongo was one. So there are large holes in our lists. Still, we had nine lifers; this is birder-speak for seeing a species for the first time. We didn’t really stop to look at butterflies, so the chances are that we managed to list only what we knew well. Contrary to my fears before I left, we were not beset by leeches even once during our walks. I’m sure they lurk in various places. It is just that it is possible to see whatever we did without coming into contact with these pests even once. In Valparai breakfast was always late and large. Our mornings started a little before sunrise. We would gulp down a quick cup of tea and a couple of biscuits before leaving for a round of bird-watching. The real breakfast would start at about nine, after we got back. It always began with a ritual serving of fresh fruits. I was really amazed at the skill with which the kitchen produced bananas sliced into two precisely equal longitudinal halves. I tried this at home, and failed miserably. Then there were idlis with the famous Tamil gunpowder and coconut chutney, perhaps dosas or adai with sambar or appams with stew, and any amount of toast with eggs. Everything was very well done. Even the bread was surprisingly good. 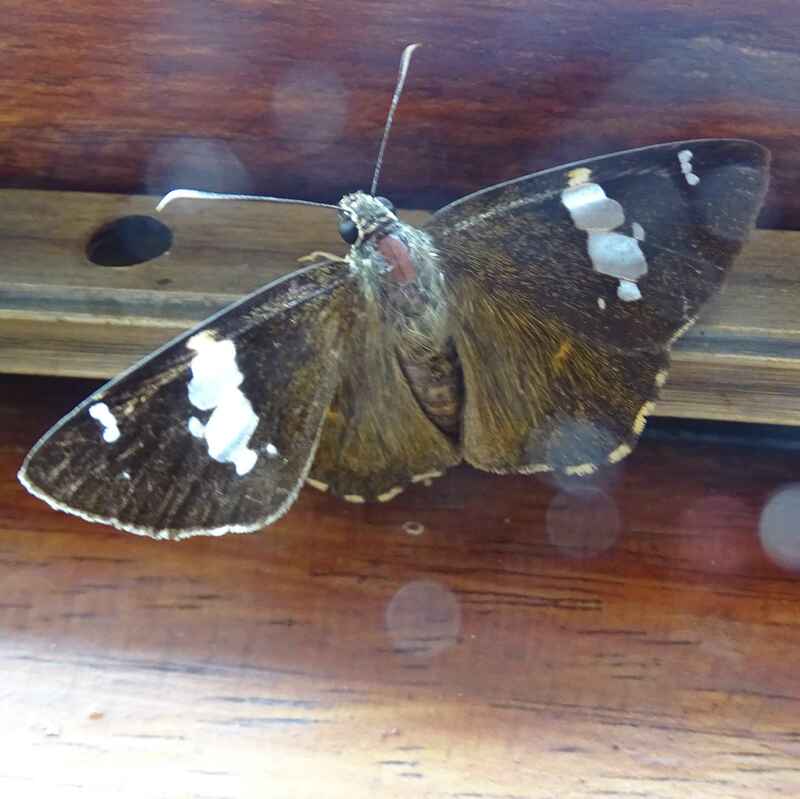 On our second morning we arrived at breakfast to find a dark butterfly fluttering around our table. The Family asked me for an identification, and I was a little stumped. I hemmed and said it was not a moth but a butterfly, one of the variety called skippers. The only way to be certain is to look at the antennae: skippers have ones which are shaped like hockey sticks. But I couldn’t get beyond that. Very tentatively I said “rice swift”, knowing this was wrong. I took a photograph for later identification. ID wasn’t so easy: it could have been the weirdly named “restricted demon” except that it had too few spots. After a couple of other false leads I finally saw the pefect match. It is the Tamil spotted flat. 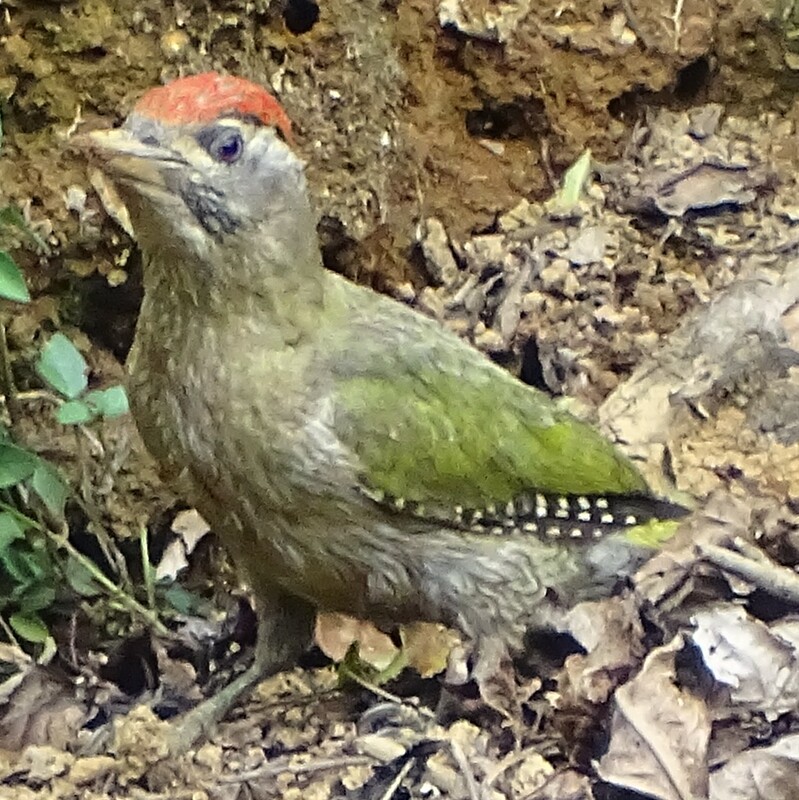 It is common in the Nilgiris. It fluttered repeatedly against the window glass, so I decided to do a good deed and opened the window to let it out. 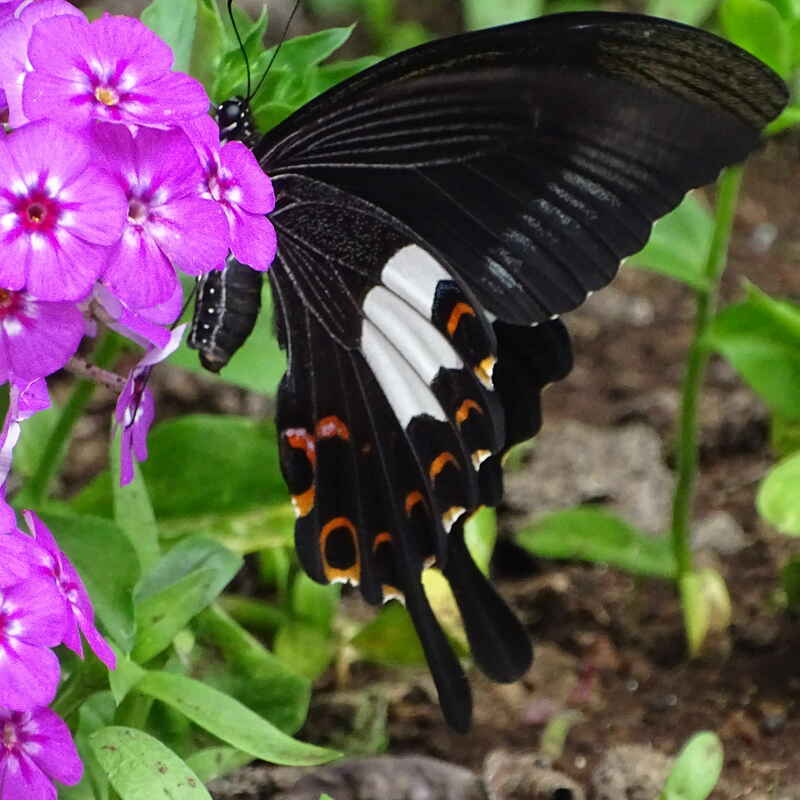 It fluttered on to the flower bed just outside. 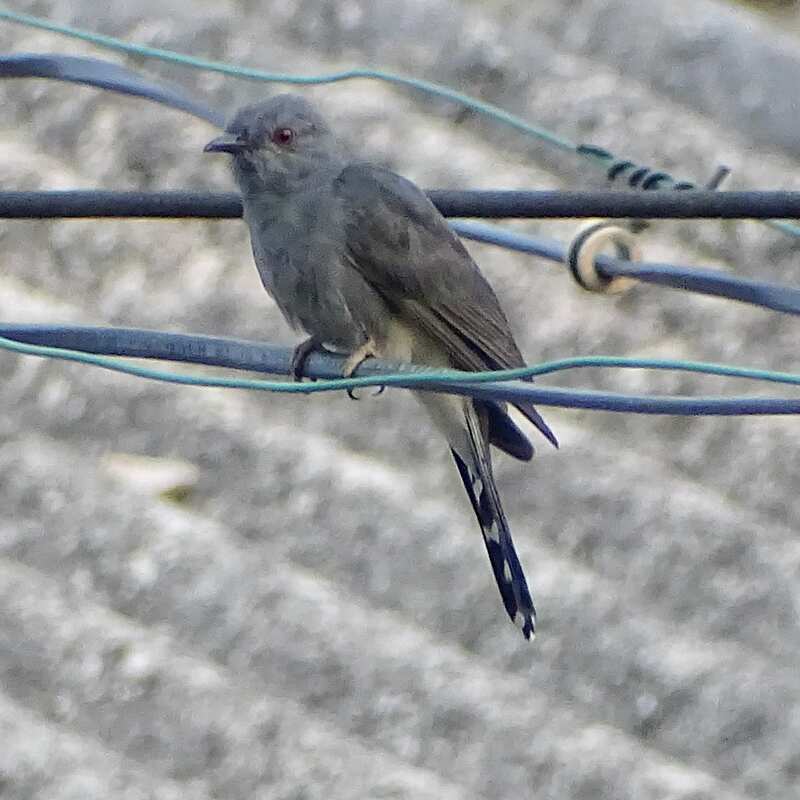 A bulbul darted in, picked it up and flew off. The Family and I looked at each other, and settled in for breakfast. 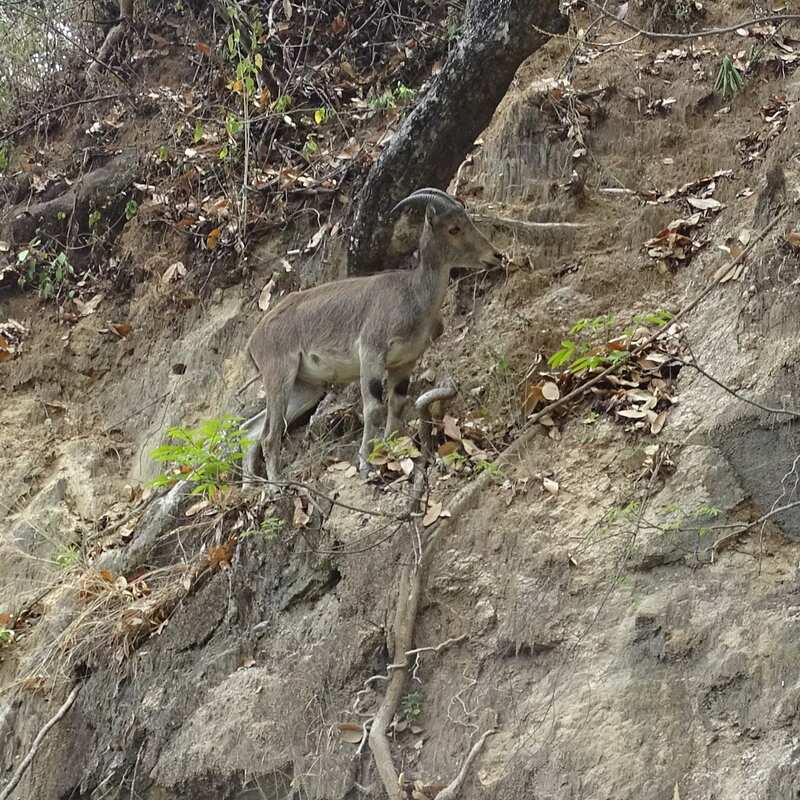 In Valparai we saw four different kinds of wild plant-eating animals: the huge Gaur (aka Indian bison), the shy barking deer (Indian Muntjac), the rare Nilgiri tahr, and the Nilgiri langur. There were also domesticated cows and buffalos, and a very small number of domestic goats. If all the grazers eat the same food, then the one that eats fastest could starve the others to death. There is the unlikely possibility that the common food plant grows really rapidly, so no species dies out. The more likely possibility is that the different animals eat different plants. In fact, as I looked this up I found that biologists use the word grazing for eating grass, and browsing for eating shrubs and bushes. So avoiding conflict by eating differently is well recognized. We frequently saw family groups of Gaur grazing among tea bushes, heads down, except when they looked up to keep an eye on us. 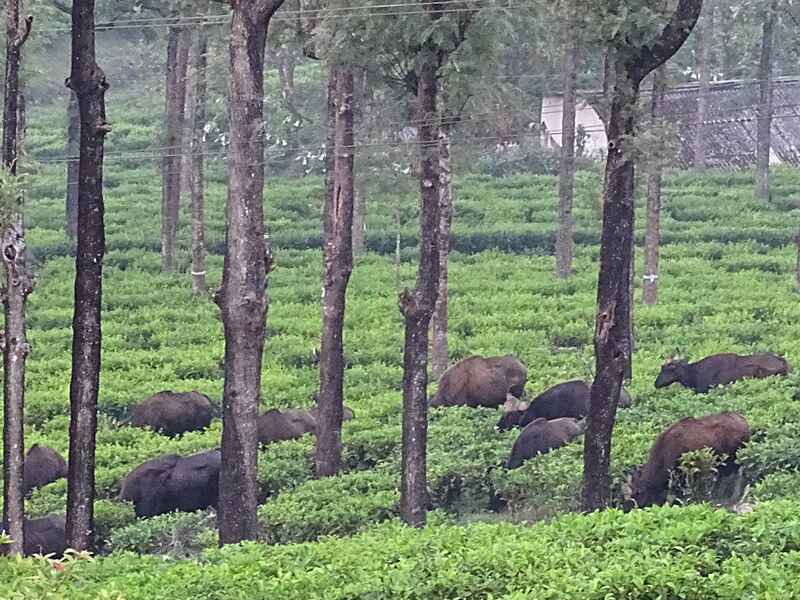 In forests we found Gaurs to be more cautious, but here on the tea estate they seem to be used to humans. 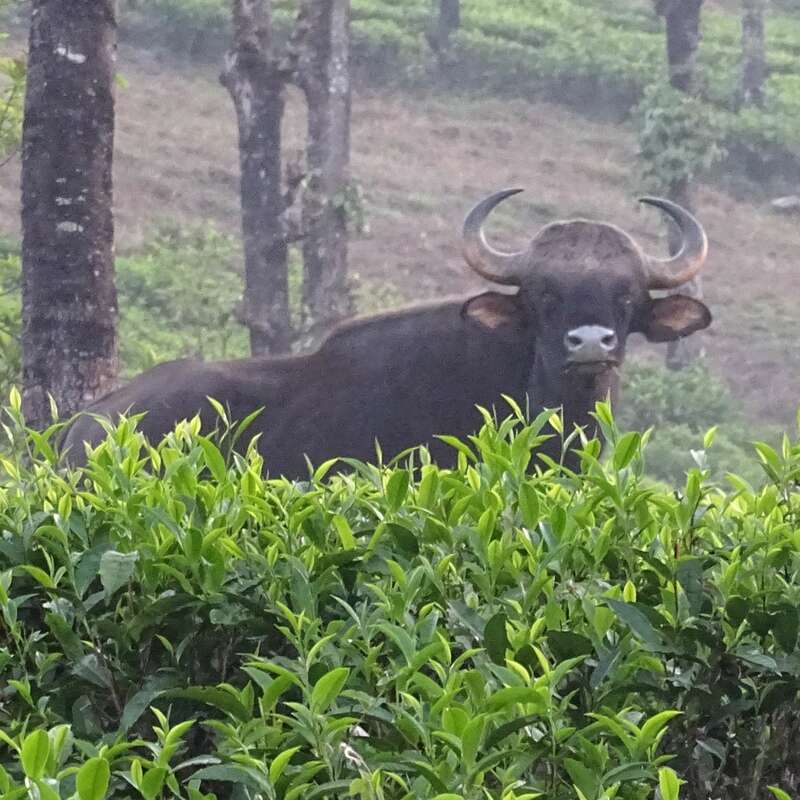 On watching closely, it appeared that Gaur did not touch the tea, preferring to eat grasses, and perhaps other plants, which grew around the tea. I walked among the tea bushes at one point and found that the paths had little other than grass. So this cousin of cattle was eating mainly grass, although they are known to eat a variety of plant material. Maybe they don’t like tea; I don’t much like Nilgiri tea myself. 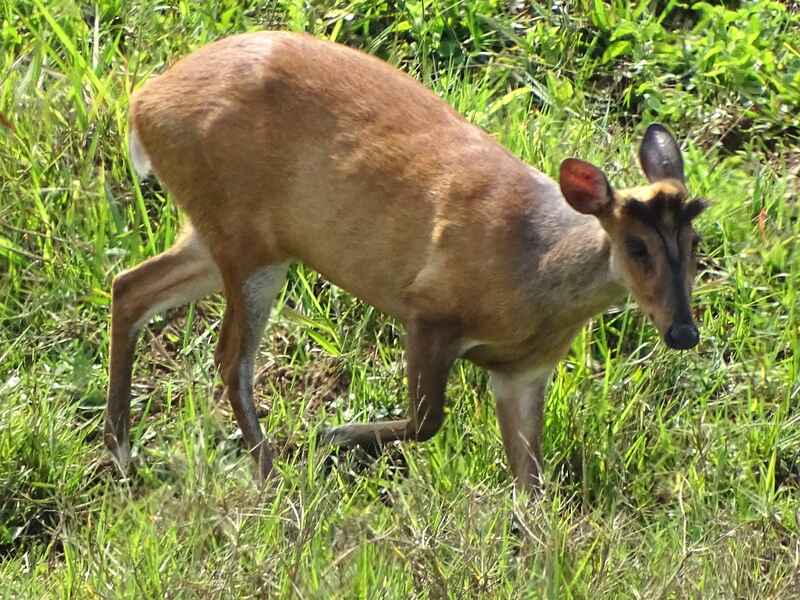 The barking deer (Indian Muntjac) is a very shy creature. We were lucky to spot one from a road above a sunken meadow. It did not bolt because it never noticed us. It moved through a patch of tea, over the grass, which it completely ignored, looking for something else. An article in the journal Mammalia explains that 80% of its diet comes from shrubs, flowering bushes and trees. Grasses make up only a small part of its diet. The Gaur and the Muntjac occupy the same range but eat differently. This is the classic strategy of two herbivores in the same geography: one grazes, the other browses. We saw a family of Nilgiri tahr which munched on grass for a while, but then started eating flowers of Lantana bushes growing by the road. An article in the journal of the BNHS claims that this is common. The tahr eats mostly grass, but also a wide variety of flowering bushes. It avoids competition with other herbivores by the fact of being nimble and eating in places where the others cannot reach. Langurs follow the same strategy. They browse leaves high up on trees, and so avoid competition with other wild herbivores in these places. Domesticated cattle are not so lucky: they eat the same plants that Gaur eat. Sometimes they are seen feeding side by side, and apparently there is occassional conflict. The Gaur is huge: often over a ton in weight and its shoulders are man-high. In a conflict, it is bound to win over domestic cattle. This does not appear to be a serious problem in Valparai, since most people here are involved in tea production and not farming. academic studies of history and Western culture. Nilgiri teas are the least aromatic of the Indian teas. On our trip to Valparai I kept coming across the various ways in which the plantations which grow this insipid leaf had devastated the rain-forests of the Nilgiris. We stayed in a bungalow built for the manager of one of these estates, so I keep my complaints a little muted. But as we left Valparai and began on the 40 hairpin bends which cross the Anamallais, The Family spotted a viewpoint with this statue. Had we found the culprit: the man responsible for this ecological devastation, the Hitler of the hills? The inscription at the base of the statue identified the man as G. A. Carver Marsh. Clearly famous in his lifetime, his memory is slowly fading. I am unable to find his full name. And of the many things he must have been known for in his lifetime, I can only find the following reference in the book Madras Miscelleny by Muthaiah S., “The Anamallais may have been opened up by G. A. Carver Marsh, perhaps the only pioneering planter remembered in South India by a statue (at a road bend near his Paralai estate) but it was three planters from Ceylon, E. J. Martin, O. A. Bannantine and Unwin Maclure, who first planted tea there”. Such is fame. All the blame I was laying on this dead man must now be redistributed. When you dig deeper, you see that coffee plantations predated tea in this region. So perhaps the blame gets diluted further. Even such a clear case of devastation cannot be traced back cleanly to a single original cause. The best one can say now it that it was the economics of a mercantile empire which destroyed this region. What then is Mr. Carver Marsh to be remembered for? The Nilgiri langurs we came across were very private. 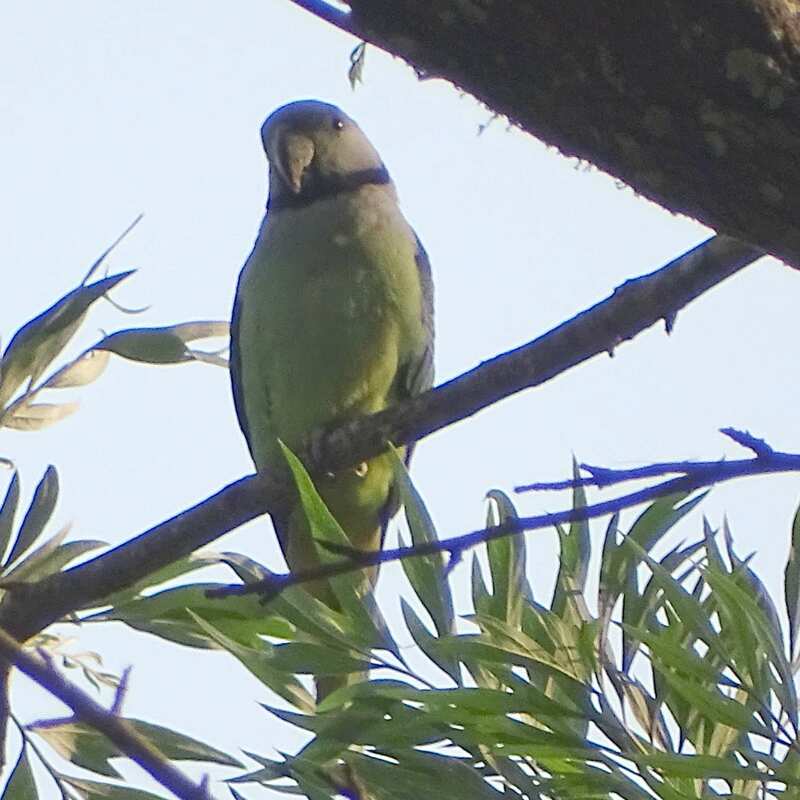 There was a large tribe of them foraging on trees by the road near Valparai. As soon as our car stopped, the nearest ones fled further into the forest. I got off and tried to photograph the ones in the next tree, and they fled as well. This happened over and over again. I got a couple of shots of one by hiding behind a thick bush and sighting through a narrow opening between its thorny branches. 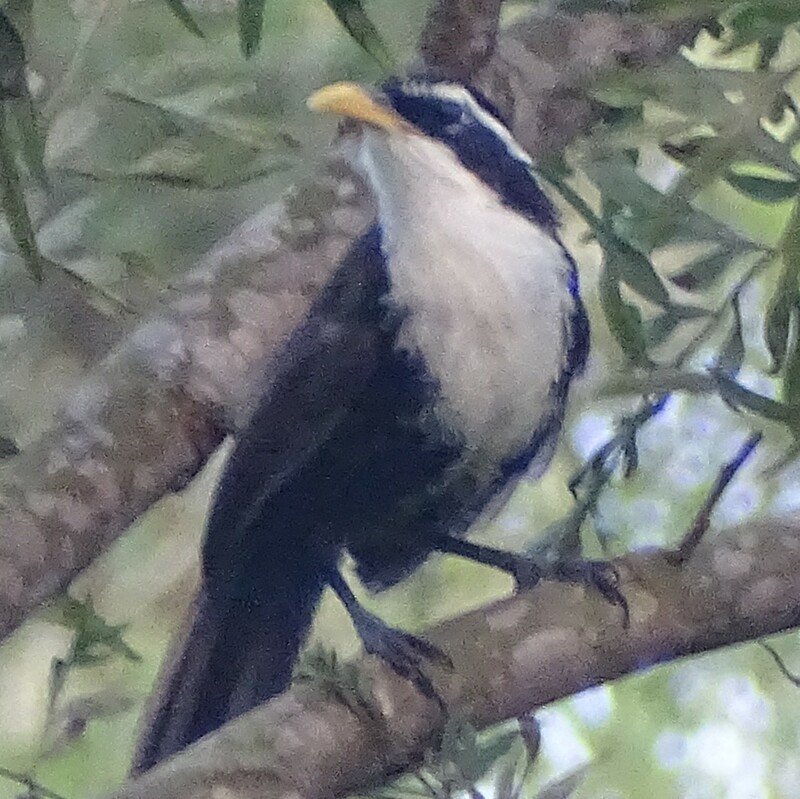 The only clear shot was of one sleeping on a high branch of a tree very far away (below). A Nilgiri langur sleeps on a branch of a tree as far from a road as it can get. I guess it finds this posture comfortable. These monkeys have a glossy dark body with a light golden brown head, and would look lovely in photos. The morning light was just right, but the subjects were shy. This was so frustrating and strange! 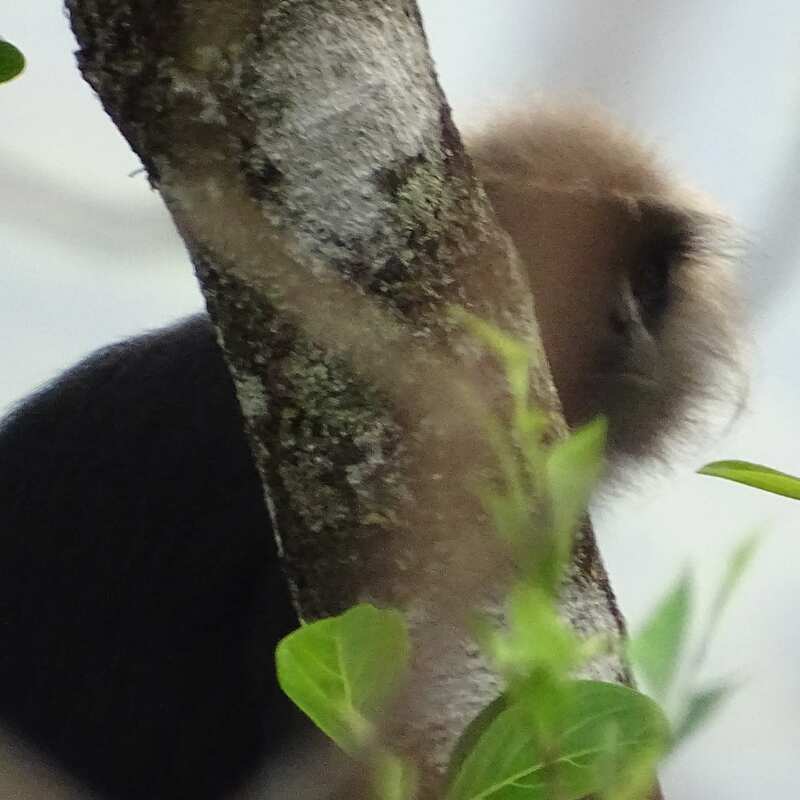 The lion-tailed macaques we saw would walk right next to us without even looking at us. So it could not only be the indirect conflict of lost habitats which was influencing the behaviour of the langurs. I just had to google this. The answer was simple: exactly as I’d thought, they were traditionally hunted, as they continue to be. Traditional medicine uses their body parts as medicines and aphrodisiac. Since the passage of laws protecting them the trade has gone underground and presumably trade volumes of so-called medicines have decreased. An important reference seems to be the 2011 studbook, but arkive is a good place for a shorter description. I learnt from the studbook that the classification of langurs is still an open question. There may be as few as 5000 individuals, and even the higher estimates still give a total population of no more than 15000. It is a pity that this beautiful monkey is so hard to see. 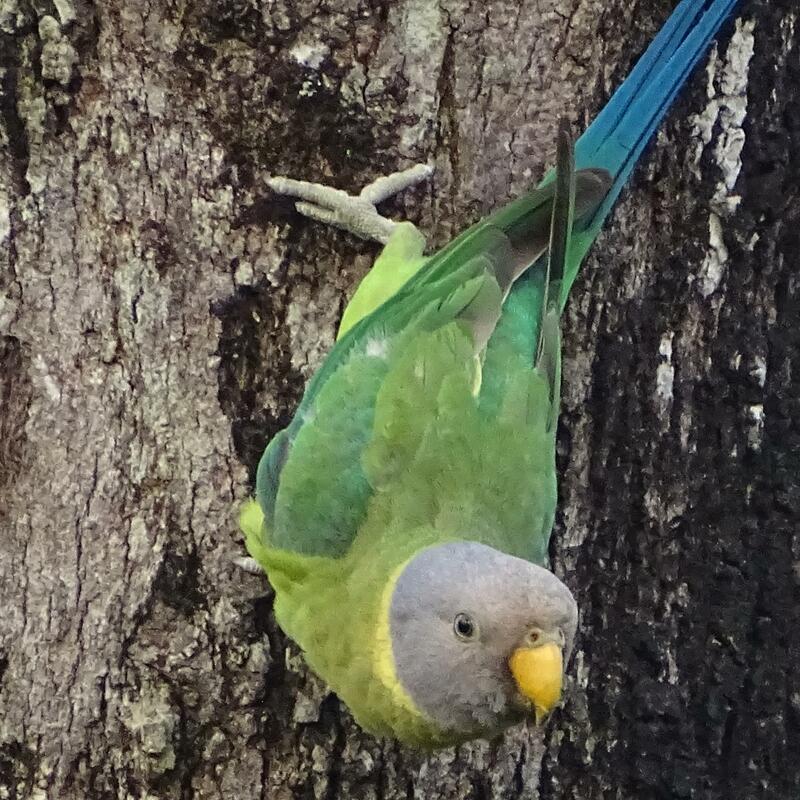 Valparai is a good base for birding and wildlife sighting. Although the ecology in the immediate neighbourhood is massively disturbed by the monoculture of tea, it is a buffer zone for the nearby Annamalai tiger reserve forest. With the boom in nature tourism in India, tea estates in this region have begun to create boutique hotels which are geared to this traffic. 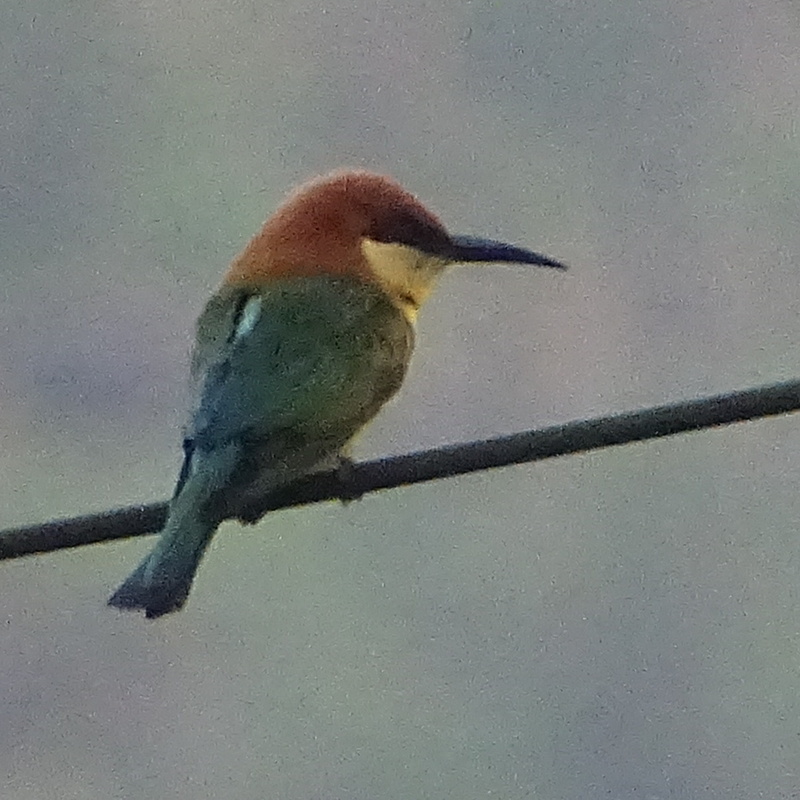 In our last few hours we had a number of lucky sightings. Going from left to right and top to bottom are pictures of one of the endangered Nilgiri tahr (Nilgiritragus hylocrius) a small herd of which crossed the road as we drove back to Coimbatore airport, a Malabar parakeet (aka the blue-winged parakeet, Psittacula columboides) seen at a distance and against the light but a lifer, a view of the confusing grey-bellied cuckoo (Cacomantis passerinus; thanks for ID help Doe-eyes), a member of a very shy band of the black-bodied Nilgiri langur (Trachypithecus johnii) which is slowly losing its habitat to humans. Like us humans, most animals and birds seem to have a fairly routine life. So an individual will usually be found at one or three usual places. That’s why a local guide helps. 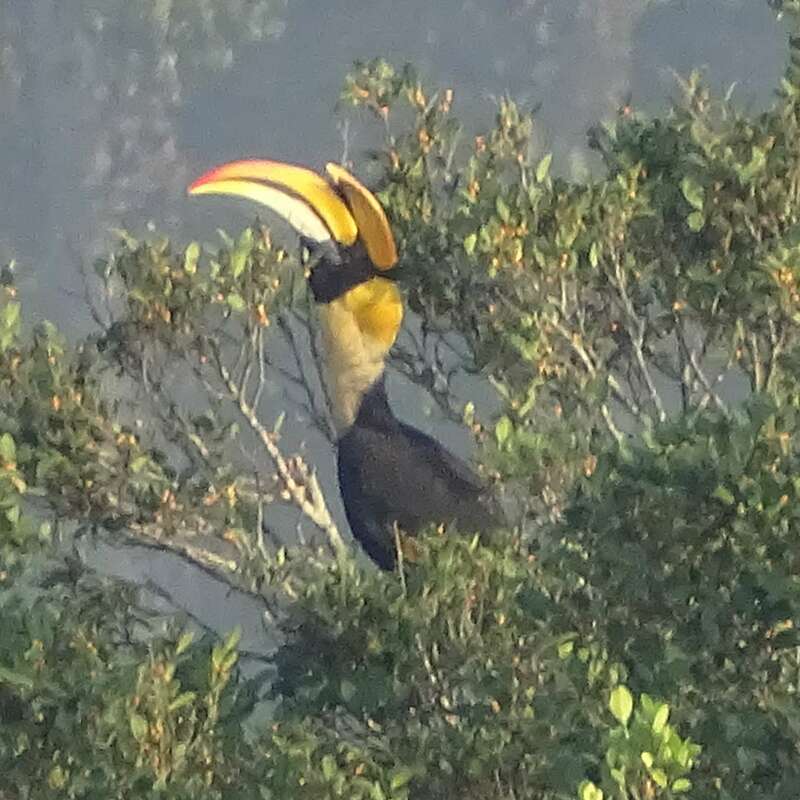 S/he knows where a hornbill has been nesting, or parrots come every day at a certain time to feed. We were lucky to have Murugan with us. He was a fount of local knowledge, and had enough interest in birds to be carrying a well-used copy of a Tamil edition of “Birds of Southern India” by Grimmett and Inskipp. More than that, he never tried to hurry us on to somewhere, but neither did he stop suggesting what he knew would be great sights. I wish we knew more than a few words of Tamil. It would have been good to have longer conversations with him. 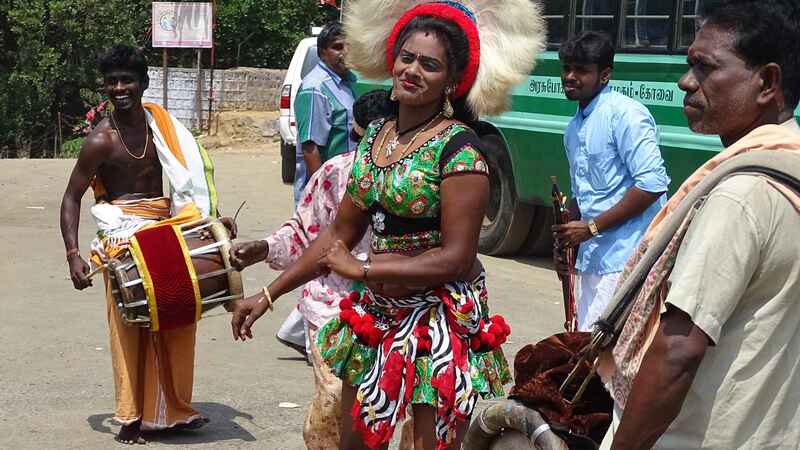 Festival of Murugan, Valparai. 4 April, 2015. 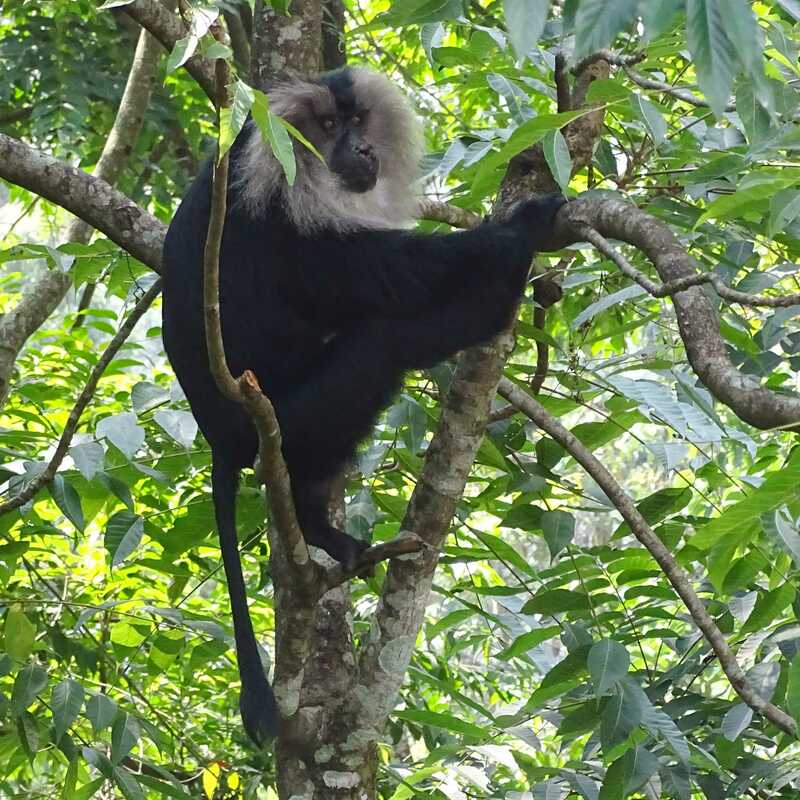 Lion-tailed macaques are found only in the western ghats of India. They were in the list of most endangered monkeys and apes till 2012. In that year the IUCN found that various state governments had taken conservation steps and the population had turned around. Now it is classified merely as endangered. 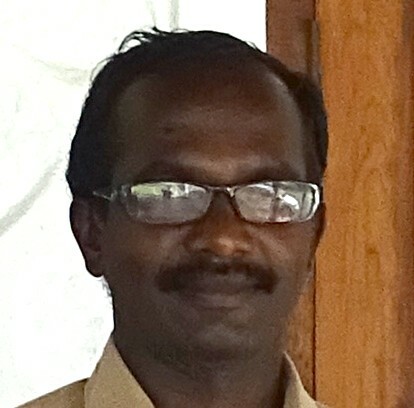 Our guide, Murugan, is full of information about the local wildlife. Whatever I can check independently is fairly correct. According to him there are three tribes of macaques in the locality. The largest has about 90 members, then there is another with about 35. The one which we saw is the smallest, with about 20. A villager led The Family to where some members of this band were exploring a trash heap. They dug through it fairly systematically and found various discarded fruits and vegetables to eat. The Family shares trips with her phone. She approached less than a human body length to take photos. I was tense, but these macaques are so used to humans that they ignored her. Lion-tailed macaques are not larger than two feet (60 cms). Apparently they live up to 20 years. Man-monkey conflict usually arises due to such closeness. One sees evidence of this in cities, where monkeys have discovered high energy foods like potato wafers, biscuits and aerated drinks. I had seen such a conflict once when my niece, then five years old, would not let go of a bottle of Pepsi which a bigger langoor wanted. An undiplomatic incident was averted when she obeyed her mother’s instructions to let go. Nothing like that happened here. The only danger we were in came when two male macaques started fighting, and forgot that a human was between them. The same villager shooed them away. The Family decided to tip him for saving her. Normally I don’t like to tip for normal human kindness. But maybe she was right in this case: when you set up an economics where the well-being of the macaques brings cash rewards to local villages, then it could lead to innovative non-zero sum solutions to possible future conflicts. 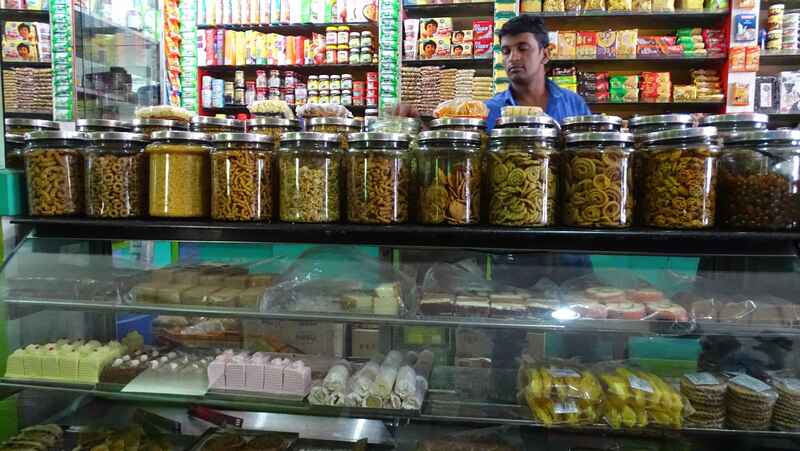 Years ago I was introduced to the delightful world of Tamil pickles. Our weekend’s hotel added one to the tally: a sweet beetroot pickle. Other than this the food was well-made but unremarkable. The Family disagrees, but she has to agree when I say “my post, my choice”. In any case, late on the morning of Good Friday we drove down to the bakery in the village. As promised, we found “eatables and other bakery items”. The bakery is outside the village temple, which was getting ready for a festival to Murugan. Temporary stalls, mostly selling toys, lined the road. Our guide, named after the day’s diety, promised that if we waited for a couple of hours the street would be packed with devotees. We made a quick escape, but caught the first of the revellers dancing at the next cross roads. 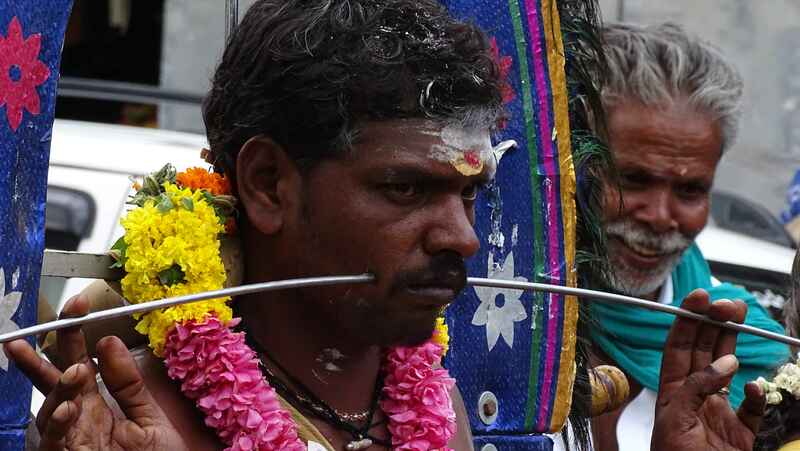 This was so totally unlike any of my mental pictures of Tamil temple festivals that we stopped to take a few photos. The group looked like a carnival held a month to late. Was it really Good Friday? We passed a church where a tuneless choir was singing. A little further along the road there was a procession carrying a cross. Relief! We were not taking a vacation on the wrong weekend.